Who, What, Why: Is it legal to hide in an embassy? Chinese dissident Chen Guangcheng has left the US embassy in Beijing after taking refuge there for a week. Chinese officials have accused the US of breaking the law and demanded an apology. Why? Chen left the embassy on Wednesday and went from there to hospital for a check-up. His lawyer said that he was now "free" - while previously he had been under house arrest. However, Chen himself later said his family had been threatened and that they now wanted to leave the country. Chen is the second Chinese national to seek refuge with US authorities in China in a matter of weeks. The first was former police chief Wang Lijun who briefly fled to the US consulate in Chengdu in February. 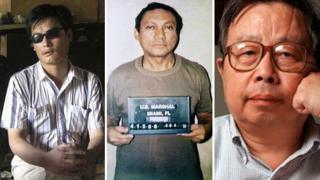 There is in fact a long tradition of dissidents seeking sanctuary in embassies, both in China and in other countries. The 1961 Vienna Convention on Diplomatic Relations codified a custom that has been in place for centuries when it established the "rule of inviolability". This states that local police and security forces are not permitted to enter, unless they have the express permission of the ambassador - even though the embassy remains the territory of the host nation. The convention is widely adhered to and is regarded as a basic pre-requisite for diplomatic relations. "Embassies are privileged areas. The local authorities have no rights to enter," says Colin Warbrick, a specialist in international law and honorary professor at Birmingham University. Human rights law provides a further layer of protection, in the form of the European Convention on Human Rights and - in the case of the US - the International Covenant on Civil and Political Rights . This means that the embassy is obliged to consider whether there is a real risk that the person could be killed or seriously injured if they were handed over to the local authorities. And if there is, then they could be held accountable if they give the person up. How Chen gained entry to the embassy is unknown - whether he walked in by himself or was smuggled in by diplomats past Chinese security guards on the street outside. If he had been a fugitive from justice and had been smuggled in, then the US diplomats would be guilty of breaking Chinese law, Warbrick says. Diplomats are obliged to comply with local law, he points out, even though they enjoy immunity from prosecution. However, correspondents say Chen's house arrest, or "soft detention" in Chinese, was an unofficial measure imposed by the local authorities, not by a court, so he was not a fugitive. One reason for the robust Chinese response is their desire to send a signal to other Chinese citizens tempted to follow Chen's example, Warbrick says. "The Chinese will not want this to become a pattern - that disaffected people go to the Americans and see what they can get out of them." Cases like this are almost always "politically awkward" he says. In this case, the arrival of Hillary Clinton in Beijing on an official visit may have provided an extra incentive to find a quick solution. "From an embassy's point of view, they would want to get rid of the person as quickly as possible to resume normal business," says Paul Whiteway, who was a British diplomat for over 30 years, and is now director of Independent Diplomat's London office. "I think it's fair to say the embassy would fret about the disruption. These cases can go on for weeks, months, sometimes even years. It is not actively greeted with open arms." The most direct parallel with this latest case is that of Fang Lizhi, a Chinese astrophysicist and government critic, who took refuge in the US embassy in Beijing in 1989, just as the authorities were launching their crackdown on the Tiananmen protests. He stayed over a year, and left under a deal which saw him take up a fellowship at the University of Cambridge, before moving to the US. He lived there for the rest of his life and died a few weeks ago. The case of Fang Lizhi was a "great loss of face for Chinese authorities," says Hugh Davies, a retired British diplomat who helped Fang to leave China, and risked becoming so with Mr Chen. Possibly the longest case ever of a dissident taking sanctuary in an embassy was that of the Hungarian Catholic Cardinal Jozsef Mindszenty who spent 15 years under the protection of the US embassy in Budapest, from 1956 to 1971. One of the largest occurred just before the fall of the Iron Curtain, when hundreds of East Germans travelled to Poland, the Czech Republic and Hungary and climbed into the compounds of the West German embassies there. "The Poles agreed to take them in sealed trains across East Germany and into West Germany," says Eileen Denza author of Diplomatic Law. "So then many more people did it - it was a wonderful loophole!" The practicalities of life inside depend very much on the facilities of the individual embassy. "They have to improvise on sleep and accommodation and feeding arrangements," says Paul Whiteway. "Larger embassies will have kitchens normally, and they might have an embassy club. They might be arranged as a compound - in which case they might have staff housing, swimming pools and accommodation where they could put someone. "But a lot of missions are not like that. It's just a floor in an office block, which would make life much more difficult."